Looking for Zebras | When we hear hoofbeats, we look for zebras. When we hear hoofbeats, we look for zebras. Yesterday when I tried to explain to a friend how Connor was dealing on his first day home after his first hospitalization for the BMT – he’s not in a good mood, but he’s not upset or agitated either – she said “so he’s just kind of resigned to it?” That’s exactly the word to use. He’s resigned to his fate and, like us, just dealing with things as they come. But let’s back up a few days. Connor went into the hospital on Monday morning happy and cheerful. Almost immediately that changed when they had to draw blood and put in an IV. This took two nurses, a child life specialist, a psychologist, and both parents to hold him in place, distract him, console him, and reward him. He was pissed at all of us. 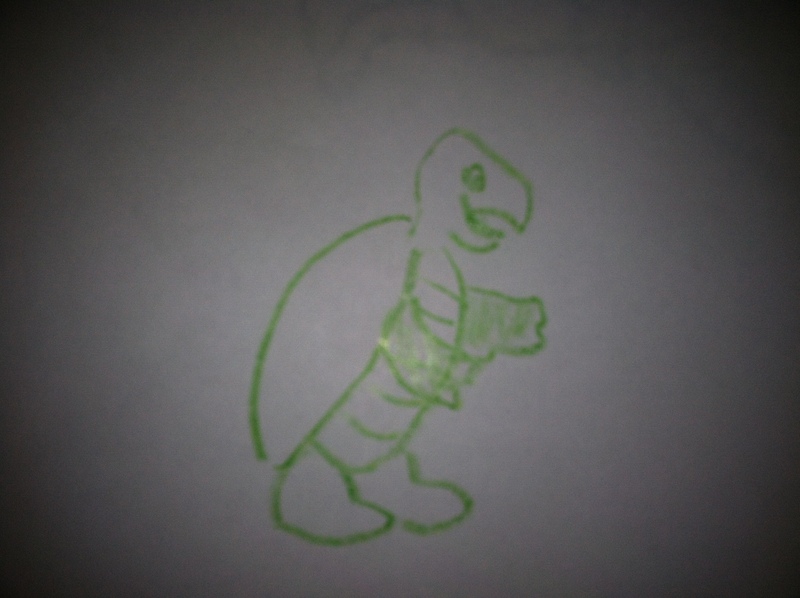 To calm him down afterwards I offered to draw him some pictures. I don’t know why this is one of his favorite activities, but it is. He instructs me on what to draw and I do my best to recreate it (keeping in mind that I haven’t taken a drawing class ever in my life and for my required applied arts classes in college I went with photography and sculpture). Until recently, he mostly wanted me to draw clues from Blues Clues, which is easy enough because Steve very nicely shows us how to draw them and isn’t a great artist himself. But now he’s getting more elaborate. 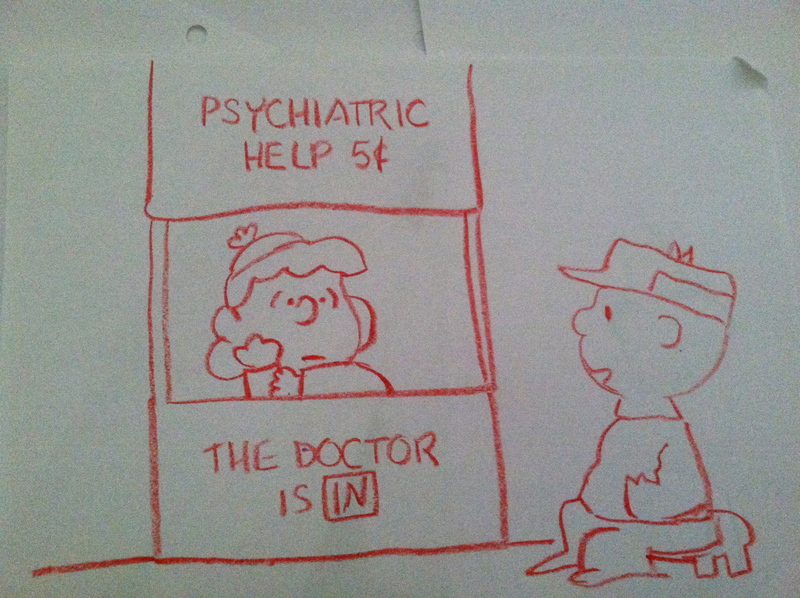 He wants me to draw characters from Disney’s Robin Hood (his favorite movie at the moment) and Charlie Brown. And he wants them to look EXACTLY like the stills from the animations when he pauses the movies. This activity kept him entertained in the oncology clinic, two OR waiting rooms, and the OR prep room (or whatever you call it where they bring you back and eight different people come in and ask you the same questions over and over and over and then you wait and wait some more until the anesthesiologist, who was one of those eight people, comes back and shoots you full of something to knock you out in ten seconds). For four hours I did nothing but create drawings on demand. We started with simple one-color characters and by the end I was drawing full color complete scenes and Connor wouldn’t let me stop until I drew in the curtains AND the trees. That was the last time we saw Connor really happy. Since then it’s just been resigned. So the surgery went well, but didn’t go as we had hoped. The original plan was to insert Connor’s Hickman line in such a way that it would come out by his shoulder, making it more difficult for him to be bothered by it and harder for him to access it and yank at it. Given how much he hates anything attached to his body, this was a real concern and we had a lot of discussions with his doctors about this. But when we got to the OR, there was some confusion–the people there thought they were inserting a Port-a-Cath, which gets implanted under the skin. There would be less to yank at, but would need to be accessed with needles (if I understand correctly, which is doubtful since I hadn’t heard this plan until just before the surgery so all of my knowledge comes from Googling it on my phone in the OR waiting room!). So not ideal, but it might be less annoying to Connor than a permanent floppy line. We agreed to this and Connor went off to surgery. Five minutes later we were called back to the OR waiting room–the surgeon had concluded that he wouldn’t be able to tunnel the Hickman line out the back. What? We thought he was getting a Port-a-Cath! But no, we were right all along–Connor was getting a Hickman line and now we were being told that we’d just have to deal with multiple floppy lines coming out of his chest. But in spite of all of this, the surgery went well. The moment of truth was when he woke up and got a look at the surgeon’s handiwork. Would he immediately start scrabbling at the tubes trying to get them off his body? While we waited in recovery, the nurses stood by with suggestions and called in an OT for further suggestions. Connor woke up and immediately starting clawing at…..his clothes. He wanted the stupid hospital gown OFF (there was some subterfuge involved here, I have to confess. Before his surgery we changed him into the hospital gown, he took it off and put his own clothes back on. We tried again right before his surgery and he fought back. So we knocked him out and let the surgical team change his clothes while he was asleep. It’s no wonder he wanted that gown off.). Once naked, Connor was much calmer. He was even more content when they removed his IV and the sticky sensors attached to his body. He wasn’t really pleased with the tape over the stitches put in at his neck where they accessed the vein for the Hickman line. But he left the central line and his g-tube alone. Not yet awake, Connor has no idea what we’ve done to him yet! 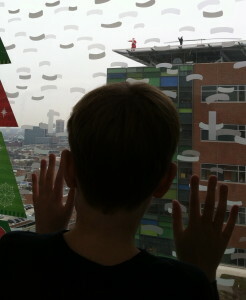 Then it was up to his room on the 11th floor while still groggy, where we’d wait for the chemo to begin. A note about the rooms in the new children’s hospital at Hopkins: OK, so they are hospital rooms, which are never fun, but this building is gorgeous and the inpatient rooms are really nice. Lots of space (for a hospital room) and storage. The parent sleeping situation isn’t perfect (our room only had a lazy-boy type of chair; most rooms have a pull-out sofa thing that is far more comfortable). But what really makes the room is the view–we had a corner room with huge windows overlooking east Baltimore and the waterfront. 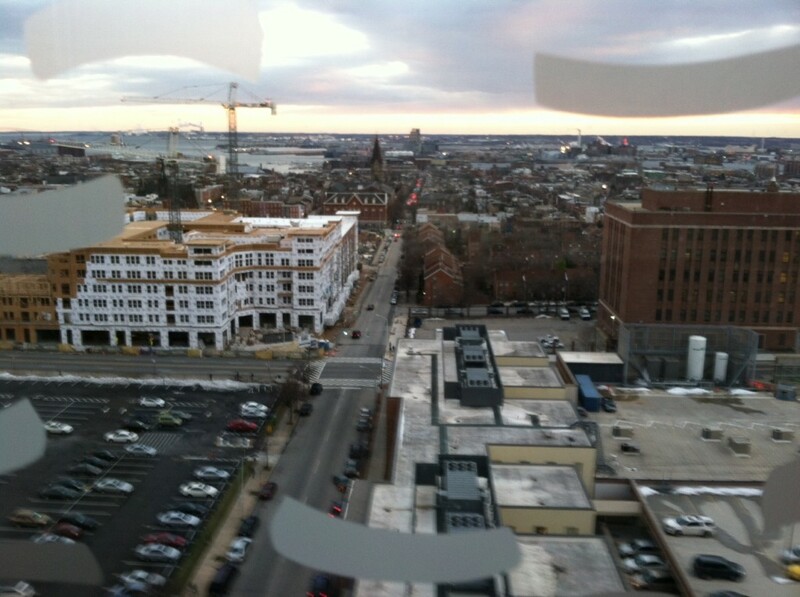 East Baltimore, btw, looks a lot more picturesque from 11 floors up! Once Connor was up and moving (that wouldn’t happen until day 2) he spent a lot of time sitting in the recliner just looking out the windows. This picture doesn’t do it justice–the construction in the forefront is less noticeable in real life. You know that feeling when you get on one of those death-defying roller coasters and they ratchet you up the first hill and you wonder what the hell you were thinking getting on this thing and then they pause you at the top of the hill before dropping you to your death and you think “I’ve made a huge mistake” but you know that a) the chances of death are actually very low and b) it’ll be over in a minute and a half anyway? That’s kind of how I’m feeling right now on the eve of Connor’s first bone marrow transplant hospital stay. Only a) the chances of death are quite a bit higher for Connor than if he were on a roller coaster and b) it won’t be over for six months or more. OK, this isn’t a huge mistake. It’s our only good option. Connor goes in tomorrow. He’ll start the day with surgery to put in a PICC line (threaded out his shoulder to the back to make it harder for him to pull it out) and a feeding tube, then he’ll start his first dose of Campath, a chemo drug that will work to kill off the bone marrow he has so that he can get the new stuff. He’ll be in for three (maybe four) days this time, then home for a week or so, then back in for the long stay starting January 19. His bone marrow donor is an unrelated donor. Brian, Claire and I were all tested and none of us matched, but we were very fortunate to find a perfect match in the donor database. All we know about this donor is that she’s a 24 year old female with O+ blood (which means Connor will get a slightly new blood type from all of this–currently he’s O-). We’ve spent the last two months gearing up for this. Connor saw a psychologist weekly to help him get used to the idea of having something attached to his body. Honestly, this has been our biggest concern. He hates having anything attached to him, so he removes band-aids, pulls out his own IV if not watched like a hawk, and shucks of his clothing at the first opportunity. Having both a PICC line and a feeding tube in for months is going to be really hard on all of us. His visits with the psychologist didn’t do much good, except to prepare the staff at Hopkins for what they might face. At the start, Connor would put up with having a fake feeding tube attached and covered up for five or ten minutes. By the final visit last week it was more like five or ten SECONDS before he’d claw it off. This doesn’t bode well for tomorrow. I keep saying that we’ll deal with it by just dealing with it. It’s really the only way to handle some of Connor’s behavioral issues. The week before Christmas Connor had his whole body tested. He had 11 appointments over four days to test his hearing, heart, lung function, and general health. He had 12 vials of blood taken, bone marrow extracted, teeth cleaned, two CT scans and a PET scan. The radiologist looked him over to make plans for radiation. He learned that the CT scan person keeps a stash of Teddy Grahams for her patients and that Santa travels by helicopter to visit sick kids. 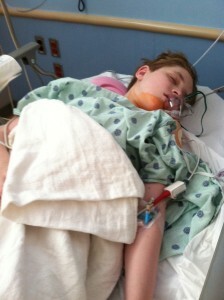 Two days before Christmas Connor had his final IV gammaglobulin infusion. It’ll be weird not having that as part of our normal life in the future, and I have to admit that I’m going to miss Joan, his nurse who came to us every four weeks for the past ten years (even meeting us when we were on vacation one year because Connor was due for his infusion that week!) and knows Connor at least as well as many of his relatives. Connor went out with a bang–he was so fed up with medical procedures at that point that he fought the IV harder than he ever has and I ended up with a black eye. Last week we had a final physical, signed so many consent forms that I think I might own another house now, and fought Connor down to swab his nostrils to make sure he’s not going into this with any viruses. And now we just wait, poised here at the top of the hill for the downward plunge that begins at 8:00 tomorrow morning. My sister gave me a domain name for Christmas! How cool is that? We’ve learned that in our family, you should look for the zebras first to save yourself some time. For your Google pleasure, spend some time looking these diagnoses up: hyper IgM syndrome, Aicardi syndrome, and xeroderma pigmentosum. Xeroderma pigmentosum was what our sister Kirsten had. I don’t know how many doctors and specialists my parents took her to before they finally got the right diagnosis, but I’d imagine it wasn’t the first diagnosis to spring to mind when faced with a little girl who got crazy-bad sunburns with just a tiny bit of sun exposure. Aicardi syndrome is the diagnosis my niece (Katie’s daughter) received when she was just a few months old. That is Katie’s story to tell, and I hope this blog will be a way for both of us to keep people up-to-date on how our kids are doing. This disorder is enough of a zebra, though, that the names of all the girls who have it can fit on one t-shirt (and it doesn’t even cover the whole shirt). And then there’s my son Connor. On day one of his life he had a bit of a fever so they started him on antibiotics. At one of his first check-ups when he was just a few weeks old his pediatrician noticed his enlarged spleen. When he was six or seven months old, he started getting infections. Just normal childhood infections at first–mostly ear infections, a few pneumonias, then weird stuff like infected hair follicles and dangerous blood infections. A wonderful nurse practitioner took a look at just the size of his file at the pediatrician’s office when he was 18 months old and sent us off to find some answers. It wasn’t just his health that concerned us, but also his development–at 18 months old he was not talking at all. We suspected this was mostly due to the number of ear infections he had, but when he still didn’t start talking after getting ear tubes put in (and btw he also didn’t stop getting ear infections when the tubes were in place, but it DID make it easier to diagnose and treat the infections) we added in testing from the Infants and Toddlers program through the county. It took a long, long time to find answers, and I’ve long since lost track of how many doctors he saw and tests he took. I do remember one poor developmental pediatrician who tried to find one answer to both the developmental and health problems. She measured his head a lot. A lot. I think he has a big head, but as it turns out that was just because he has a big head and not because of anything wrong with him. More than a year after we started all of this testing, we had our answer(s): Connor was diagnosed first with autism and then, within two months, with hyper IgM syndrome. Hyper IgM syndrome is a primary immune deficiency disorder wherein your body can produce LOTS of IgM (the immunoglobin that responds first to any immune system attack) but the B cells can’t switch production to any other type of immunoglobin, so basically you have a crappy immune system with no memory to it so you can get the same virus over and over and over, vaccines don’t work on you, and you are really susceptible to bacterial infections. The most common form of hyper IgM syndrome is X-linked (meaning the faulty gene is passed from mother to son; and by “common” I mean that it happens in one birth of every 1,000,000) but Connor has an autosomal recessive version of the disorder, which is far more rare. Apparently my husband Brian and I both carry the gene for this, and the chances of two people with this recessive gene finding each other, having a baby together, and having this baby each get the lousy gene instead of at least one good one is just so small that really we probably would have had a better chance of winning the lottery. At one point we figured out the odds of having a child with both hyper IgM syndrome and autism and it was something like one in 2,000,000,000. On diagnosis, Connor started receiving monthly infusions of gammaglobulin, which provided him with the IgG immunoglobins he can’t produce, but there is no way to replace IgA or (less importantly as anyone with allergies knows) IgE. The IV gammaglobulin kept away the really nasty diseases and for many years this is where we stayed. Still lots of bacterial infections, monthly IVs that were no fun at all for Connor, but overall things weren’t bad. And then three years ago his immune system went whackadoo (and yes, one of the doctors did indeed use this term). His lymph nodes started swelling up for no apparent reason, followed by his spleen, and along with this he was intensely itchy (and when I say intensely, imagine the worst poison ivy you’ve ever had, then triple the itchiness of that, and then have it NEVER HEAL. Connor didn’t sleep through the night for about six months because the itchiness kept waking him up. He’d take off his shoes to grind his feet into rough surfaces until his skin came off and he bled. It was awful.). Again with the testing, which really didn’t give us any answers but at least ruled out lymphoma, which is what his immunologist first thought it was (“he should see an oncologist like, yesterday” we were told). The eventual treatment we landed on was a drug called Rituxan, which stopped the whackadoo-ness, and lots of steroids (which led to other forms of whackadoo behavior). When the symptoms started up a year after we had stopped the treatment, we hit him again with Rituxan and all was well. But at that point our immunologist said that if this keeps coming back, we should consider a bone marrow transplant, which is the only way to cure a primary immune disorder. That brings us up to this summer, when Connor stopped eating, lost a lot of weight, and then woke up one morning in August with his stomach bloated and one leg completed swollen. Turns out the stomach (that looked for all the world like he was 6 months pregnant) was because his spleen was so enlarged and the leg was just because the swollen spleen was cutting off circulation within his lymph system. Or something. And this time the Rituxan didn’t do the trick, or at least not entirely. And since we know that people with hyper IgM are at an increased risk of developing lymphoma, everyone involved agreed that the bone marrow transplant was our only option. So that’s the backstory of Connor, his “zebra” diagnoses (although really autism can hardly be counted as a zebra), and where we stand at the beginning of 2014. *I’m JOKING, University of Maryland School of Medicine! I’m sure you’re a fine institution and that you’re very good at all kinds of diagnoses, zebras and horses alike!